The classic Pinoy “mad dash” to offer a very similar product, in this case, boneless pork belly, is on in the Queen City of Cebu. In the next few months, more and more similar retailers will inevitably appear, and it will be one of the latest pork crazes for sure, just like it seems Balamban liempo was last year, and roasted chicken was before that, etc. Cary’s is a long-time purveyor of lechons in Cebu and a respected brand name. So is CNT, Alejo’s, Rico’s, etc. and I wonder how many will join the bandwagon, and how many new folks will set up their own stalls. As for consumers, they seem to be easily taken with the same product presented in different guises… We used to have inihaw na liempo, lechon kawali, and now, boneless pork belly. I wish all lechon purveyors in Cebu well, and I do believe healthy competition is always good for the consumer. But please don’t say Zubuchon copied the idea from you, okay? That claim could potentially land you a lawsuit. :) Like I said, we have had this on the Zubuchon menu since June 2011, but by no means have we ever claimed any ownership over it. Our version has no MSG added at all, no mixes, no shortcuts. We roast it wrapped around natural bamboo poles and we posted a pretty comprehensive recipe and list of ingredients on previous posts on this blog for all to see. I just made one last weekend in our backyard in Makati, so it’s really simple to do at home as well, see the photos below and ignore the one with Marketman in boxer shorts, hahaha. If you can’t be bothered to cook your own, you can order one instead. “Boneless Zubuchons” are flying out the doors with clients who insist on checking them in as baggage on their trips to Manila. For inquiries, please call 032.254.7342 and look for Yoli or Victor or Eva. They range in size from roughly 5-7 kilos cooked weight, and a six kilo Boneless Zubuchon would easily feed 20 hungry folks. Price is PHP480 per kilo. We do NOT airfreight the boneless lechons unaccompanied, as we are concerned about the total transit time for the meat (a much smaller and exposed cut of meat rather than a whole roasted pig). For this version of Marketman’s whole roasted boneless pork belly, I used a rather western ingredient profile, not quite a porchetta, just imbento… Lots of kosher salt and cracked black pepper, three whole heads of slow roasted garlic, two handfuls of slow roasted shallots, lots of fresh thyme, italian parsley and rosemary. Dried whole Italian red chilies. Good olive oil. I didn’t have a good needle to sew the pork up so we had to wrap twine around the belly instead. I actually like the effect this technique imparts, but for folks who want a smoother skin, you may have to “suture” it. Does that make sense? Dry the skin surface, add salt and slather with olive oil. Roast over coals and watch the intensity of the heat closely. This will take 80-110 minutes, depending on the size of your pork belly and the heat source. Use a meat thermometer to be sure and take the meat off the coals when the internal temp hits 160F internally. Boneless Roasted Pork Belly a la Marketman. It was delicious, with the crispest skin ever, and absolutely no sauces necessary. Served this with a leafy green salad and a nice hearty rice and prawn paella-ish dish. Sarappppp! Wish i can do that here in our little back/front yard! 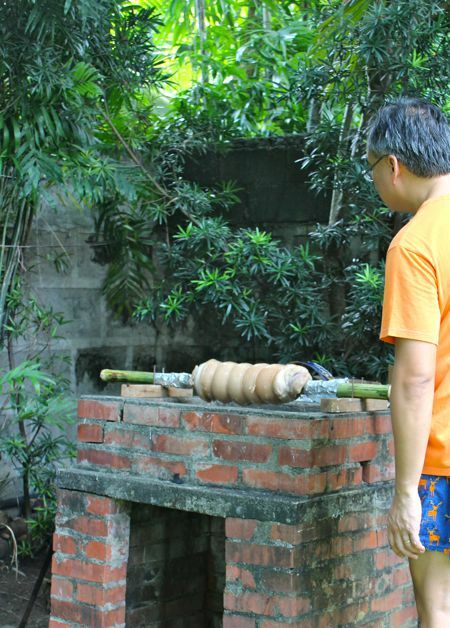 Wonder which is more attractive, the boneless pork belly roasting on the pit or the ternong t-shirt and shorts. Color coordinated talaga. he.. he .. he ..
that is a real beauty! i can almost feel the crackle on my teeth! your my idol pa rin super marketman! hi MM, this look sooooo good and i can smell the roasting from your garden (hahaha, how i wish we were neighbors). … lol! shorts and shirt color coordinated as mentioned by @bakerwannabe, hehehe. 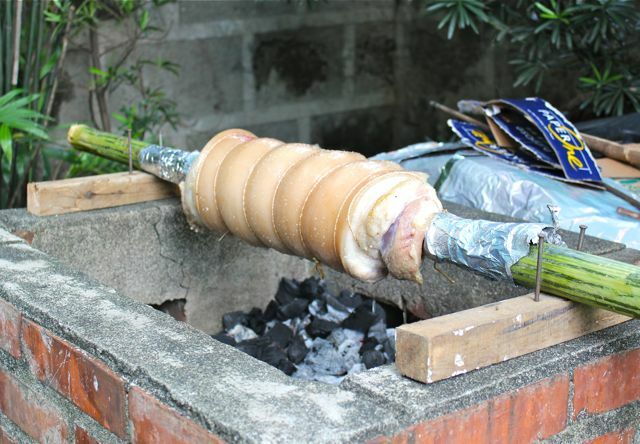 Will try making boneless pork belly roast on the 4th of July,Will use my Showtime rotisserie,for I won’t have a patient hubby ,who would watch the roast for 80 min.outside:)Question MM ,Just in case we do this outside in charcoal, Do you hand crank the bamboo like lechon,or let it stay at coal and turn it every so often? OT, the Zubuchon facebook page is ridiculously awesome!! it is a torture to look at those pix,so hungry..so far away. Looks absolutely delicious, but those shorts are quite distracting. MM, I “copied” your pork-skin-as-pin-cushion technique to wonderful results on my homemade lechon kawali (with bones!) I don’t know if sunbathing my pork for about 6 hours also helped, but the skin is one of the crispest I’ve had. Thanks! The “mad dash” has reached Quezon City too. I saw a new-ish tarp signage offering boneless pork belly as well. Sleepless, if you want more of a pinoy taste, try a stuffing of garlic, onions, lemongrass, a bit of kikkoman, bay leaves, chilies if you like spicy, salt, pepper, etc. 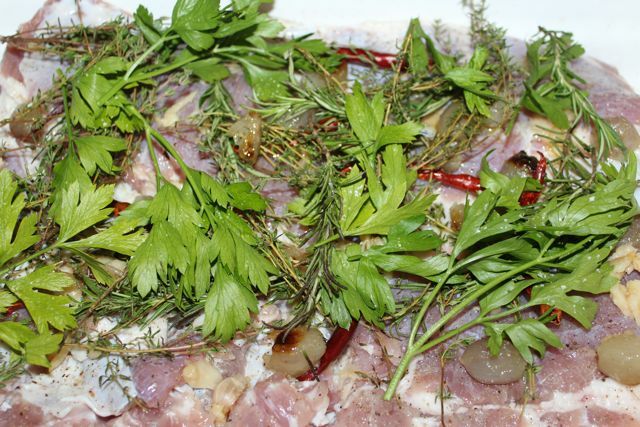 Brine your pork for a few hours beforehand. Dry, dry, dry the skin with paper towels before roasting. Cheryl, bawal ata mag-import ng lechon into the UAE, no? Thanks MM!! Really..Really.. appreciate this and quite giddy^_* for your response,Will do the Pinoy style. I am an “rabid” reader of your blog,done a lot of your recipe,even budbud kabog with success,This means a lot to me, your recipe sharing had open a new horizon on food for me.Thanks again. This is what I miss, the backyard ihawan! Here you have to reserve the bbq pit in advance, pay a non-refundable fee and carry everthing to that location, and under time pressure if somebody else booked a time slot after you. Aiyoh! yes, upon careful scrutiny *gasp* I was able to figure out that the orange thingies are reindeer. hehe. I was also under the impression that the belly had to be turned constantly, and until reading your comment that that’s not the case, I was completely contented with just planning a trip to Cebu to have a taste of the now rather in/famous “boneless pork belly”. Now I’m seriously considering trying my hand at this, although that will entail lots of extra work (we don’t have an outdoor grill, yadda yadda). LOL…MM in boxers! Nice legs…hehehe. on the serious side…the pork looks absolutely delicious!!!! What?!?!? Boneless pork belly is patented! All you copiers will be at the mercy of a genius 18-year old if you do not terminate your boneless pork belly experiments immediately! 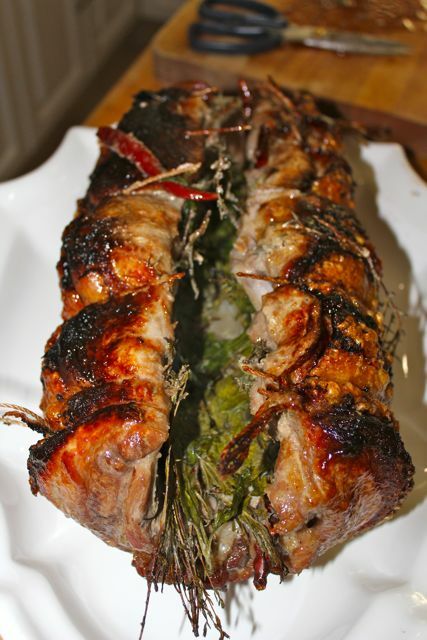 Thanks for sharing the “controversial” boneless lechon, MM…will COPY this for sure! ;-)…	and thank you too for the ‘distraction’ of the legs errr the shorts…. MM, is it possible to achieve this crackling skin through a turbo broiler or an oven? drooling….i am going for a trip to ur resto this weekend, as my cousin from manila is arriving…deffo pigging out! Sorry MM, couldn’t help it. I will be heading over to my pork purveyor today! I’ll definitely try the Pinoy style but I won’t be able to cook over charcoal as our resident’s association bans charcoal grills on our back deck, so I’ll do this with my rotisserie over a gas grill. I’m so glad that I was able to taste Zubuchon 3 weeks ago at the Mango Ave. branch. The cheeks were the best part! ;-) the chicharon was the best! gaaahhh…now i’m hungry..wishing i was in cebu. Angel: I’ve made pork belly / ribs with crackling in an oven. Key is to ensure the skin is dry (sprinkle with salt to draw out the water, and wipe the salt off before roasting). Then pop it into a very hot oven (i.e. 475-500F) for 25 minutes, and lower temp to 375F. Additional cooking time should be around 35 minutes per pound. I actually have a 4 lbs. “liempo” at the ref right now (and kitchen twine), I wanted to this in the oven and Wysgal, I might just follow how you did it. 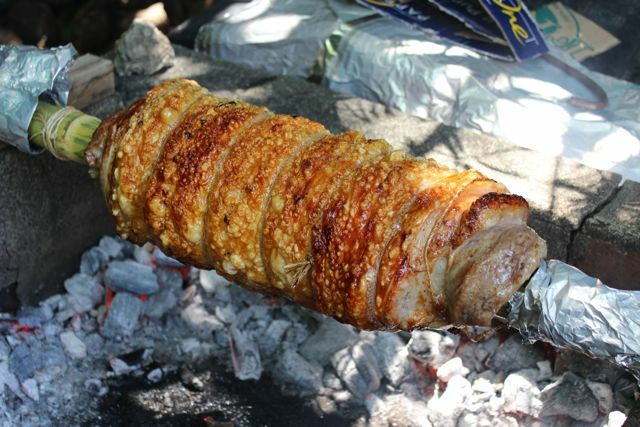 In sort of similar topic – – I was in Pinas this last May, had my dream of having a 1 month and 2 weeks old “piggling” into lechon (Fed only with vegetables and table left over – no store bought feed). Roasted in front yard (with my staff & relatives watching)…. it was goooddddd…. but…. I stuffed the inside with almost everything that MM put in his posted recipe.. but… I patted and massaged it with Korean Marinate! It made the skins soft and rubbery, and almost burn until I had to stopped the lechonero from continously “brushing” it with the sauce. Like I said, the taste was awesome. I should have just used salt & peppers with the organic palm/coconut oil. your branches so she doesn’t have an excuse not to get some for me. Yum!!!!!! Lol! 18 year old genius is going to have a heck of time suing everyone cooking the “IT”dish. Your the man Market Man! Up to a year or maybe a year and a half, I noticed that a few Filipino restaurants offering lechon on the west coast, stateside, were making a point that their lechon was ‘Cebu’, ‘Cebuano’ or ‘Cebu-Style’. @Getter Dragon 1: i tend to agree with what you said. just got back from the states and indeed most of the lechons (had two of them while there) are said to be prepared Cebu style! This boneless lechon is now being offered in my neck of the woods as well. @ Terry – where were you visiting? Obviously, I’m trying to make a connection. Hope your trip here was fun. @ Ted – LOL…see what I mean. Hi Marketman, Will definitely try this in Cambodia! ;) & Will do this with Kampot Salt & Pepper. I have to say thank you for your recipe of Bacolod Chicken Inasal. Prepared it last Father’s day and other expats here loved it! Best grilled chicken ever! ted, thanks for that! Amazing how fast and common it is becoming! From Italy to Cebu to California… how’s that for global?! :) Faith, glad the chicken inasal recipe worked for you, it’s one of my favorites and a real reader favorite as well. All the lechon pictures always look so gooooodddd and yummy!!! MM – doesn’t the twine burn off? yay! drooooling! I prefer the blistered skin also… roasted beautifully! Oh my! I’m 2 months preggy and craving for this… got to have this ASAP! Sana meron din kayong branch here in manila. 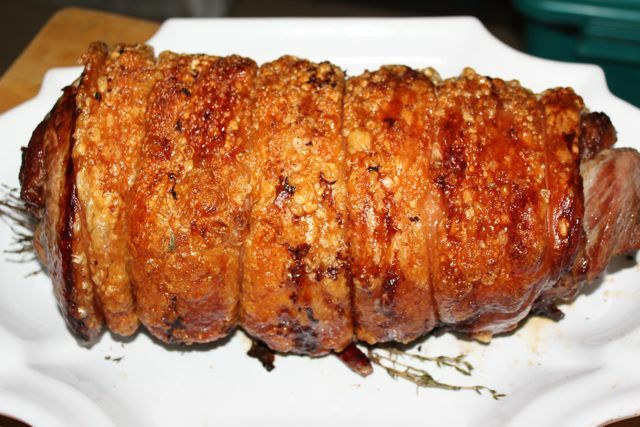 MM, Wysgal: I tried cooking this rolled-pork belly in my oven, it came out good (skin not so crispy), but flavor wise, it passed my american husband’s taste. But… gosh….. the splatter it made on my 2 months old oven… I will have to clean my oven much longer that it took to cook the pork. I told my husband that I will have to improvise roasting it in our gas grill outside; just have to invent how to rotate it.. I tried the “self-cleaning” feature on our oven… and it did not work (splatter was all over the sides and top of the oven). I wanted to try and make one of these yummy looking babies but I tried to buy a big pork belly(as u mentioned- like 5 to 6 kilos) in the supermarket but its been like a week now and I still can’t find one. The lady and guy there in the Meat section just told me that all of the pork bellies were sold out already or are reserved. I have been to like 10 supermarket locations for the past week already but they keep telling me the same reasons. Maybe I will just have to buy it instead of making it. ayayay, that picture looks sooo good, MM. I was wondering where I could get some fennel bulb/seed/tops here in Cebu. I think it would go well with roast pork.